Super Hero Boy: Whats better than a dragon game? Whats better than a dragon game? 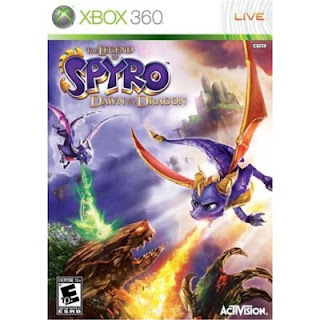 I have always wanted to play the previous version of Spyro the Dragon. I absolutely love dragons and I love video games.. so what is not to like? The Legend of Spyro - Dawn of the Dragon has to be one of the most beautiful games I have played thus far in the "fighting" category. Built primarily to give younger players a family friendly version of an action and fighting game its very cartoonie and reminds me a bit of a fantasy action game cross between Sonic and World of Warcraft. If your not a game freak you will have absolutely no clue of what I'm talking about and I know the World of Warcraft thing is totally far fetched but I am really referring to the fact that basically Spyro is a coin collecting game like Sonic though unlike Sonic you actually have to kill things to collect your coins and thus by your upgrades but the over exaggerated cartoonish dragons and the beautiful background does give me moments that make me wish I was still playing World of Warcraft and thus it reminds me a bit of it or at least the graphics that I love about it. The Legend of Spyro Dawn of the Dragon has to be one of the easiest action games I have ever played, not so much easy in that its boring and short, but I mean that the controls are really simple and though I have seen many games like this marketed at the younger crowd but then being too difficult for most of them to manage I'd really like to say I think even my mom could figure out how to play this one. Really with the exception of a few pretty tough battles and a little bit of figuring out how to use the dragon flight features its really easy. Though with that said there are a few challenging features of the game and the ability to upgrade and tweak your attacks that will really appeal to older gamers. I would certainly classify Spyro in one of those genres of games that I love to play when I just need to relax. The more adult action games though tons of fun can really end up getting me and my friends worked up but this one is the perfect game to come home to after a stressful day and just play. With a rating of 10+, that's most certainly not from it being unappropriated for younger players and I'm pretty confident when I say I think an experienced player that's younger would have no issues with it. The Legend of Spyro - Dawn of the Dragon is available right now on several platforms, PS3, Xbox 360, DS, Playstation 2, and Wii! I ended up playing the Xbox 360 game and you can pick up all of the versions on Amazon!